This composition consisted of 4 different transformations. My pre-image is located in quadrant 2. For my first transformation, I reflected my pre-image along the origin(point c) into quadrant 4 to get image 1. For my second transformation, I reflected my image along the x-axis into quadrant 1 to get image 2. For my third transformation, I rotated my image 180 degrees counterclockwise around point d into quadrant 3 to get image 3. 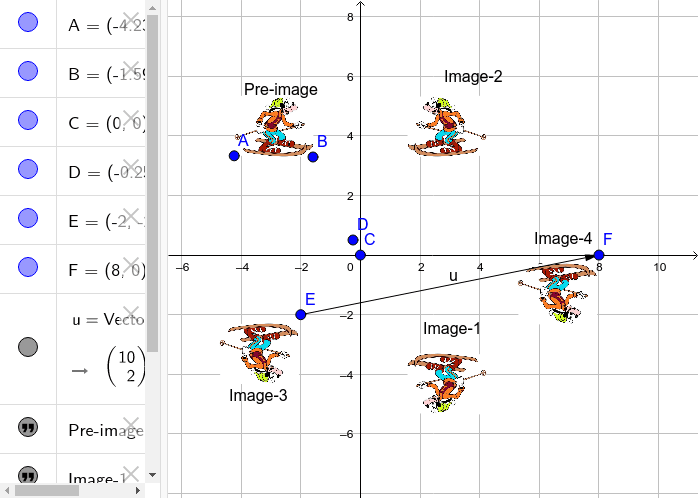 For my last transformation, I translated my image 2 units up and 10 units to the right or(x=10, y=2) to get image 4.